While the popularity of the “Disney Princess” has never really waned (or left fan art), the massive success of 2013’s Frozen put the archetype back in the zeitgeist in a big way. That explains why Disney has announced it’s moving the release of its next princess feature, Moana, from 2018 to 2016. According to Deadline, Moana follows a teenaged Polynesian princess undertaking a mythical quest. She uses her seafaring skills to search for a fabled island in her ancient South Pacific home of Oceania. Along the way she meets a demigod named Maui, and the action-packed movie follows the duo as they face “enormous sea creatures, breathtaking underworlds, and ancient folklore.” Disney released a lovely piece of art from the film (seen above) and the Internet has responded enthusiastically, which is pretty surprising for the Internet. Moana is clearly a big priority for the Mouse House and one the company is eager to get it right. Having caught flack for introducing white princesses in both Tangled and Frozen, Disney is harkening back to the cultural and racial diversity it celebrated in the late 1990s. Moana will be the second Disney heroine of Pacific Islander descent (the first was in 2002’s Lilo & Stitch) and the fifth princess of color in the company’s official line. Like virtually all Disney princess films, Moana will be a female-driven story, although it doesn’t seem to feature the multiple female leads that made Frozen so unique. Frequent Disney collaborators Ron Clements and John Musker will direct the film. They previously helmed The Little Mermaid, Aladdin, and The Princess And The Frog, but this will be their first venture into CG animation. 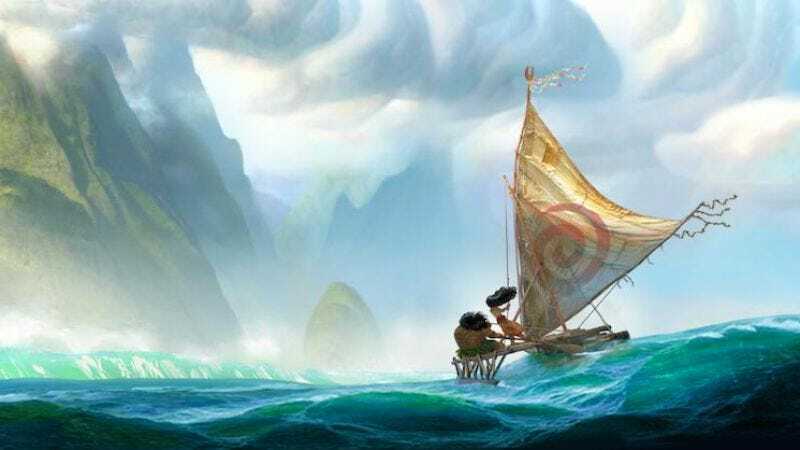 Hopefully their involvement will allow Moana to combine the best parts of the “Disney Renaissance” era with the best parts of its recent hits like Wreck-It Ralph, Tangled, and Frozen.